Susannah Israel was given the opportunity to work at Mission Clay Pipe factory in PIttsburgh, Kansas, which is where this large sculpture was created. 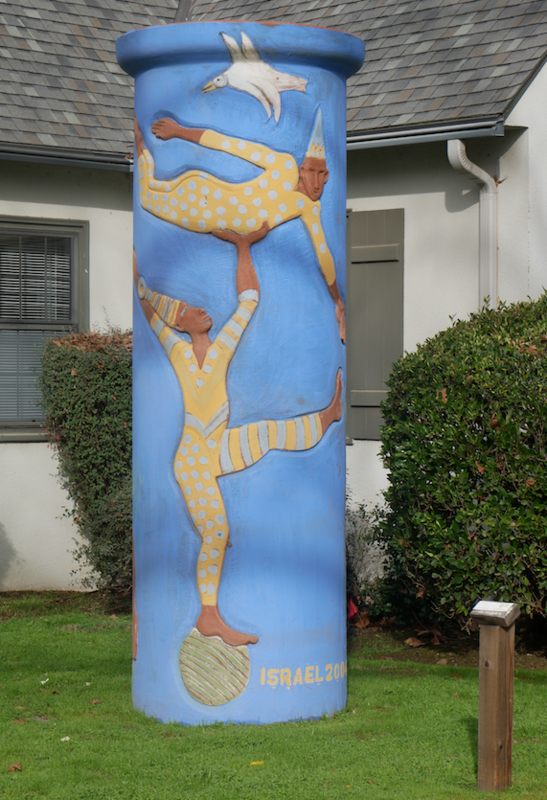 “Circus” was one of 12 large terracotta sewer pipes that she created in a series of work. Susannah describes the process as such… “For a large image like the trapeze artist in Circus, I needed to carve deeply around the arms and face. This represents a special problem, since the clay body used for industrial pipe contains a huge proportion of refractory material, and the pieces range from sand to lumps the size of small marbles. Inevitably these do seem to appear right at the point of fine detail, like an eye or lip.” She goes on to explain her refining process and the techniques she so wonderfully displays in creating this whimsical piece.